Subhas Chandra Bose was a great patriot and a determined fighter of national freedom. He was born at Cuttack (Orissa). Unlike other prominent leaders of the Indian freedom struggle, Subhas strongly believed that an armed rebellion was necessary to wrest independence from the British. 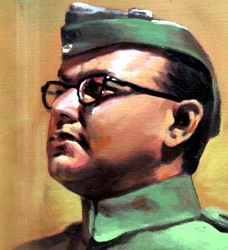 Subhas Chandra Bose is popularly known as 'Netaji'. In 1943, he organized the Indian National Army (I.N.A). He gave to the nation the Salutation and slogan of 'Jai Hind'. The famous words of Subhas Chandra Bose are "Give me blood, I will give you freedom". He was posthumously decorated with the title 'Bharat Ratna' in 1992. However, the Supreme Court of India declared on 4th August, 1997 that the press communiqué dated January 23, 1992, used from the Rashtrapati Bhavan to confirm Bharat Ratna "Posthumously" on Netaji should be treated as cancelled as this proposal was dropped by Government in deference to the sentiments expressed by Public and his family members. He is said to have died in an air-crash in 1945.